Even though you may not feel something happening at the moment of using Your Flaura sprays----pay close attention to how you are shifting-- or you could miss how powerful they are. They are miracles! Your Flaura is our line of customized personal flower remedies created to balance your unique energy with flower frequencies you select from our bouquet of master Flower Cards from Living Essences of Australia. 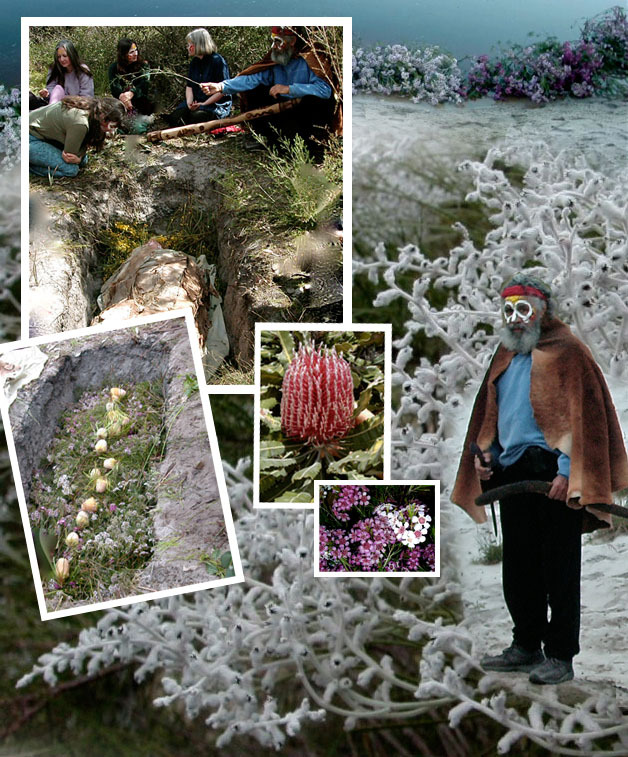 For thousands of years the aboriginal healers of Australia have created Earth Sauna Healing for their Tribes by immersing a person into a healing pit in the earth surrounded by flowers. This tradition is carried on by Vasudeva and Kadambii Barnao, founders of Living Essences of Australia. They capture the vibrant CHI of their flowers, by pouring healing water over each individual flower to create a healing resonance for your aura. These flower pictures allow you to create your own personal formula to support your journey into well-being. Every man woman and child, around the world using Flower Essences and Aromatherapy as a means of bringing harmony and balance into their lives. 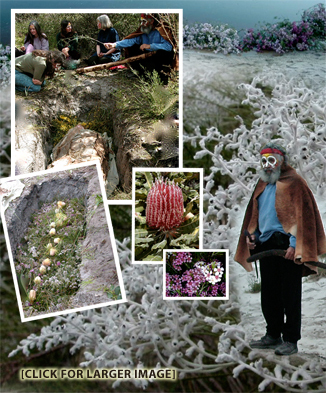 For thousands of years the aboriginal healers of Australia have created Earth Sauna Healing for their tribal members by immersing a person into a pit in the earth surrounded by native wild flowers. Flower Essence energy healers Vasudeva and Kadambii Barnao, founders of Living Essences of Australia, carry on this tradition every year with aboriginal shaman who facilitate the healing process. On the Friday before the ceremony everyone gathered the wild flowers that would be used the next morning for our healing. We placed them in the lake nearby to gather the light from the sun and stars as they floated on the water. At midnight the men went into the bush and dug six healing pits and started fires inside. After awhile when the fires had burned down, they covered the coals with a thick layer of soil. We arrived at the site before sunrise to be transformed with the traditional face painting symbols of the Nyoongah people of BiBulmun Tribe. After hearing the Bibulmun Elder Nunjan tell beautiful Aboriginal stories of creation and about the Rainbow Serpent we were led to the Earth Sauna Healing pits. We as a group carried the flowers and sang the chants we had learned at the Vasuedeva and Kadambii's school the previous weeks. Nunjan directed that specific flowers be placed in the three pits for the men and the three pits for the women. The wild flowers we had picked the day before were transferred to cover the bottom of each pit. Water was poured over the flowers in the pit and we were asked to lie down inside. They covered us with blankets made from the paperbark tree. All the while the didgeridoo was playing and everyone was singing and chanting, stomping their feet and waving branches to keep the energy moving. After I climbed into my pit, and they covered me with the paperbark blanket, I closed my eyes and listened to Nunjan play his didgeridoo and all the melodious sounds of the voices singing and chanting. It was amazing! The moist heat radiating up from the flowers permeated every pore in my body and as I relaxed into the experience I started to see in my mind’s eye blue and pink circles with strings between each one, moving in the air over my body. At the end of Nunjan’s music, the vision transformed and I saw a dot--string--dot--string--dot--string throughout all seven circles, and I felt more aligned with my purpose than ever before. It was quite a beautiful and exhilarating experience. I immediately experienced feeling more centered and focused, and have found the ability to trust and observe that every event is unfolding exactly as it should, (but not necessarily as I had planned). When obstacles or disagreements arise I sometimes find myself laughing at them, or just observe the events as they unfold without controlling them or take them personally. Since the healing pit I seem to be able to watch other peoples movies, not get caught in the drama and more easily go inside and choose my best response. I hope to return to Perth in the near future to experience it again. If you are inspired and would like to take the journey with me, please email me with your intent.